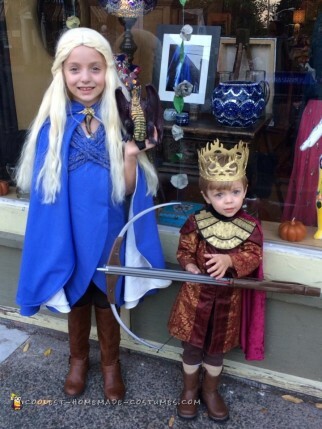 My daughter doesn’t watch the show, but she is familiar with Game of Thrones’ The Mother of Dragons from YouTube clips she’s seen, and she decided that she wanted to be her for Halloween. So I decided to make her the blue cape dress since it’s colder where we are in the Northeast and I wanted her to be warm for trick-or-treating. I bought blue fabric and white fleece to line the cape for warmth. I made my own pattern and sewed the dress and cape. I weaved braids and attached them to the dress to make it resemble Daenerys’. I also made the Dragon claw necklace out of Sculpey clay and put it on a chain. I bought her knee-high brown boots, and she wore brown pants underneath the dress. I attached the cape with Velcro as well as a brooch that I had and spray-painted it gold to resemble the one Daenerys wears. She held a toy dragon. I bought similar fabric to one of the tunics he wears on the show. I made my own pattern and sewed him the tunic with a faux leather trim. I made the neck armor out of foam sheets purchased at the craft store, added detail to it using a glue gun, and then spray painted pieces of gold. I Velcro’d it on to the tunic. I also sewed a cape out of crushed velvet and attached it using elastic going over one shoulder similar to Joffrey on the show. I put black pants and black turtleneck on him to wear underneath, as well as brown leather boots. I also bought him a small-sized crossbow.